Craps can be an intimidating game for the beginner. The table seems to have about a hundred different kinds of bets. Critical to the understanding of Craps is that it is a game of rounds. The first roll in a round is called the Come out roll. Sometimes the outcome of a round will be determined on the Come out roll. In particular a 2, 3, 7, 11, or 12 on the Come out roll immediately ends a round. If any other total is rolled (4, 5, 6, 8, 9, or 10) that number is called the Point. A white puck is placed on an area of the table to designate what the Point is, in case you forget. If a Point is rolled the dice will be rolled continuously until the same Point is rolled again or a 7. Select the amount that you would like to bet with each click. Click on the chip amount and this will be added to the “Amount to bet per click” section. Once you have the correct amount click on the region of the table for the type of bet you wish to place. You may change the amount that you bet on different sections by changing the amount in the “Amount to bet per click” section. The chips will be placed on the table. Green areas indicate bets that can be placed (added to); conversely, red areas indicate bets that cannot be made. To remove a bet from the table right click on the bet. The amount of chips will be removed from the stack on the table. Clicking on the Roll button after placing a bet starts a new round and sets the dice in motion. After the dice come to a rest, losing bets are removed from the table, and winning bets are paid. For winning bets, the original bet amount is returned after the winnings are paid out. Also, any bets that tie (push) are returned. Clicking on the Repeat button will repeat all the bets made on the previous round that can be validly placed now. Clicking on the Clear button removes all the bets on the table that can be removed. Most bets can be removed, added to, or deducted from at any time. Exceptions would be the Pass and Come bets, and you cannot exceed the maximum bet on the odds. When moving the cursor over the bet regions a yellow “tag” will appear that gives the name of the bet, the current amount placed for that bet, and the minimum and maximum amounts that can be placed on that bet. If a green highlight appears in a region, that indicates this bet can be placed or changed. If a red highlight appears, this bet cannot be increased (but sometimes can be removed). The Pass Line is the most fundamental bet in Craps, almost every Player at the table bets on it. The Pass Line is an even money bet. You start by placing your bet on the Pass Line area on the table on a Come out roll. If the Come out roll is a 7 or 11 you win, which is also called a “natural”. If the Come out roll is a 2, 3, or 12 (Craps) you lose. If any Point is rolled on the Come out roll if the Point is rolled again before a 7 you win. If a 7 comes before the Point you lose. That is all there is to it. Once you understand the Pass Line bet you are ready to play Craps. You may want to practice using fun money a few times before playing for real money. Once a Point has been thrown you may bet up to 2 times your Pass Line bet on the 'odds.' The odds are simply an additional bet that the Point will be rolled before a 7. Because the probability of the Point being rolled first is less than 50% you win more than you bet if it happens. Specifically if the Point is a 6 or 8 the odds pay 6:5, if the Point is a 5 or 9 the odds pay 3:2, and if the Point is a 4 or 10 the odds pay 2:1. A person betting on the Don't Pass is not the bet of choice by many Players, since this bet is betting against the shooter. This is also called a "wrong" bettor and is usually winning when everyone else is losing, and vice versa. The Come bet is like the Pass Line bet but may be made at any time. Like the Pass Line bet you might also put money on the odds if a Point is thrown on the first roll after the Come bet is placed. There is a nuance to the Come bet the Player should know about. If a Point is thrown and there are still active Come bets on the table waiting for a different Point then special rules apply for the following Come out roll. The Come out roll will still apply to active Come bets but it will not apply to their respective odds bets. In the event a Come bet is resolved on a Come out roll then the odds bet will be returned, while the original Come bet will be lost. What the Don't Pass is to the Pass, the Don’t Come is to the Come. If the shooter rolls a 2 or 3, you win. A 12 constitutes a tie. You lose on 7 or 11. Any other number is the “Come Point”. You win if a seven is rolled before the Come Point and lose if the Come Point is rolled before a 7 is rolled. Place Number Bets: This is very similar to laying odds. You may bet on a 4, 5, 6, 8, 9, or 10. If the number you bet on is rolled before a 7 then you win according to payoff schedule below. These bets work just like the odds except unlike laying odds you don't need to have a Pass Line bet. Place number bets are ON or WORKING during a come out roll. These bets can be removed at any time. Buy Bets: This is essentially the same as the Place Bet, only with a different payoff. 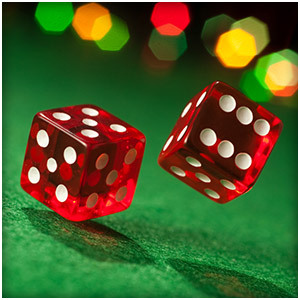 The Player may "buy" any of the Points (4, 5, 6, 8, 9, and 10), which means to bet that the number will be rolled before a 7. When making a buy bet, you must pay a 4% commission and your bet will pay fair odds if it wins. Fair odds are 2:1 on the 4 and 10, 3:2 on the 5 and 9, and 6:5 on the 6 and 8. Another way to look at it is that the buy bet pays 48:25 on the 4 and 10, 36:25 on the 5 and 9, and 144:125 on the 6 and 8. The pay out on all bets will be rounded down to the nearest quarter. Lay Bets: The lay bet is the opposite of the buy bet and the same as the Place Bet to lose but with different paybacks. The lay bets may be placed on the 4, 5, 6, 8, 9, or 10. The bet itself is that a 7 will be rolled before the number you choose. Because the 7 is the most likely number to be rolled you will bet more than you can win. The Player must pay a 4% commission on the possible winnings and the fair odds are paid on the bet itself. Fair odds are 1:2 on the 4 and 10, 2:3 on the 5 and 9, and 5:6 on the 4 and 8. Another way to look at it is that lay bet pays 12:25 on the 4 and 10, 16:25 on the 5 and 9, and 12:15 on the 6 and 8. Hard Ways: There are four different hard way bets. For example, a hard 4 bet is betting that a pair of twos will be rolled before a 7 or any other way to roll a total of 4. This is called "the hard way" because it is harder to roll two twos than a one and a three. Likewise, you can bet on a hard 6, 8, or 10, each of which is a bet that the hard way of rolling the given number will occur before a 7 or any "easy" way. Place Lose Bet: A Place Lose bet is a bet that 7 will be rolled before a roll of 4, 5, 6, 8, 9, or 10. Similar to Don’t Pass bets and Lay bets, Place Lose wins if a 7 is rolled before the selected number. A Place Lose bet loses if the selected number is rolled before a 7. Lose odds are 9:5 on the 4 and 10, 7:5 on the 5 and 9, and 7:6 on the 6 and 8. Big 6: A bet that a 6 will be rolled before a 7. Pays even money. * Big 6 and 8 are not able to be placed on the Come out roll and are NOT working on the next Come out roll after a Point is rolled. The table below is a summary of the various place number bets for quick comparison. Chips will not be broken, any payout that is not an even dollar amount will be rounded down to the closest dollar. For example a $5 Place bet on the 6 or 8 will pay $5 while a $6 bet will pay $7. A $5 bet on the 5 or 9 odds will pay $7, not $7.50. Proposition bets either win or lose on the next throw. Specific descriptions of the various bets are below. Craps 2: A bet that a 2 will be thrown on the next roll. Pays 30:1. Craps 3: A bet that a 3 will be thrown on the next roll. Pays 15:1. Seven: A bet that a 7 will be thrown on the next roll. Pays 4:1. Field Bet: This is a one time bet that the next roll will be a 2,3,4,9,10,11, or 12. The 3,4,9,10, and 11 pay even money, the 2 pays 2:1 and 12 pays 3:1.